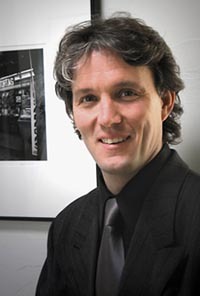 Previously, Julian Cox has served as Curator of Photography at the High Museum of Art in Atlanta, Georgia, during which time he has significantly expanded its permanent collection of photographs and enhanced its reputation in the field. He has organized such distinguished exhibitions as Harry Callahan: Eleanor (2007), Road to Freedom: Photographs of the Civil Rights Movement, 1956-1968 (2008) and The Portrait Unbound: Photographs by Robert Weingarten (2010). His most recent exhibition, Signs of Life: Photographs by Peter Sekaer (2010), consisting of 87 vintage prints, is the first comprehensive presentation of the work of this important Danish-born American photographer, whose works are among the finest produced in the Depression era in the United States. Prior to that, Cox served for 12 years in several positions in the Department of Photography at the J. Paul Getty Museum in Los Angeles, most recently as Associate Curator of Photography under the Getty’s esteemed Founding Curator of Photography Weston Naef. His work at the Getty included the exhibitions André Kertész: A Centennial Tribute (1994), Alfred Stieglitz: Seen and Unseen (1995–1996), Julia Margaret Cameron: The Creative Process (1996–1997), The Making of a Daguerreotype: Images and Artifacts (1998) and The Photographs of Frederick Sommer: A Centennial Tribute (2005). Prior to that, he worked at the National Museum of Photography, Film and Television in Bradford, England, and the National Library of Wales, Aberystwyth. Cox earned a Master of Philosophy degree in the history of photography from the University College of Wales, Aberystwyth in 1990, and a Bachelor of Arts degree in art history from the University of Manchester, England, in 1987.